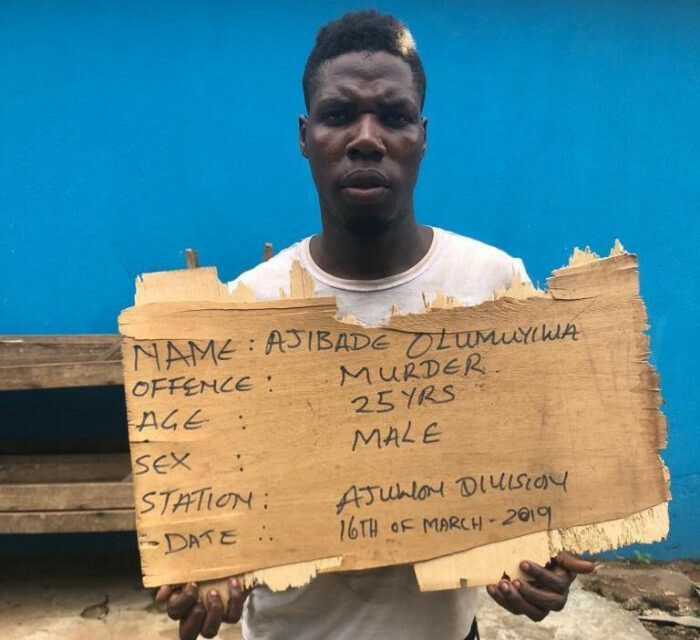 The Ogun state police command has arrested 25-year old man, Ajibade Olumuyiwa, pictured above, for allegedly killing one Olakitan Balogun, who he alleged was having an affair with his wife. Ajibade was arrested following a distress call received by the Divisional Police Officer, DPO, of Ajuwon Division from residents of Doland Estate that a man had murdered his wife's side man right inside his house. On interrogation, the suspect explained that he came to his house in the middle of the night and met the deceased right inside the house with his wife, which he said infuriated him and then he started beating the man. In the process, he hit his head against the wall which led to his death. His wife however denied having an affair with the deceased. She said her husband had abandoned her in the house for the past eight months with an instruction to the gate man to be monitoring her and be giving him information if he saw her with any man. She stated further that the victim was a cobbler leaving within the area and that on that day, the deceased’s girlfriend came to pay him visit and that since he was not living alone, he decided to bring the girl to a room in the house due to his closeness to the family. “But as soon as the gateman saw him, he alerted the husband who rushed to the house and descended heavily on the deceased without listening to any explanation from her and the girlfriend to the victim,’ she said.